Blueberries are grown in a variety of temperate areas worldwide. They are known for their delicious flavour, but are also prized for their nutrition. Green Origins source their blueberry powder from Chile, where the soil and climate are ideal for growing high-quality blueberries. Chile is surrounded by natural barriers such as the Andes Mountains, Atacama Desert, Patagonian ice fields and the Pacific Ocean. These protect the Blueberries from agricultural pests. Green Origins Blueberry powder is freeze-dried, minimising nutrient loss. Blueberry is a source of Iron, which helps support the immune system and contributes to the maintenance of normal cognitive brain function. Organic raw freeze-dried Blueberry powder from Chile. Take 1 teaspoon per day, mixed with water, juice or a smoothie. Alternatively sprinkle on or add to food. Start with a smaller serving and increase gradually. 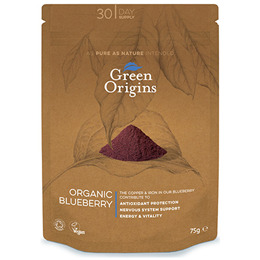 Below are reviews of Green Origins Organic Blueberry Powder - 75g by bodykind customers. If you have tried this product we'd love to hear what you think so please leave a review.